The company has conducted extensive rock chip, channel, trenching along with soils and geophysics and believes it has identified a number of high priority targets. Conduct 1,000 m of drilling at Luna Roja project testing three prospective targets with eight planned drill holes in Q4/18. 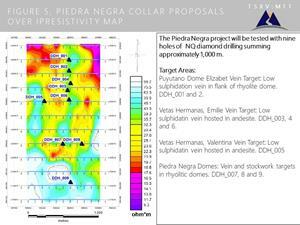 Conduct 1,000 m of drilling at Piedra Negra project testing three prospective targets with nine planned drill holes in Q4/18. TORONTO, Oct. 11, 2018 — Magna Terra Minerals Inc. (the “Company” or “Magna Terra”) (TSX-V: MTT) (SSE: MTTCL) is pleased to announce that it has retained MD Perforaciones S.A. to execute a first phase drill program encompassing approximately 2,000 meters at its Luna Roja and Piedra Negra projects in Santa Cruz Province, Argentina. 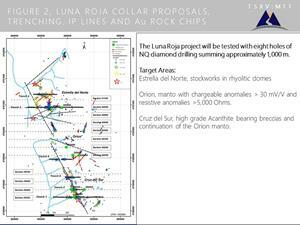 Drilling is anticipated to commence by late October initially at Luna Roja. The Luna Roja Project is located on the northern edge of the Deseado Massif, in Santa Cruz Province (see figure 1), approximately 75 km NW of the Don Nicholas Mine and 30 km N-NW of the Las Calandrias Project (New Dimension Resources). Luna Roja is a low sulphidation Au/Ag project with significant potential for vein and breccia hosted high grade mineralization as well as manto style disseminated mineralization between the base of the extrusive rhyolite domes and the paleosurface of the underlying andesites. The Company has planned a program of eight diamond drill holes constituting approximately 1,000 m to test specific targets in this first phase. The Company has completed significant work to date in facilitating the drill targeting process (see Figure 2), which includes 360 rock chip and float samples including saw cut channels and an additional 741 trench samples, 711 of which are channel samples with the remaining 30 being selective. Further, there are 715 soil samples and 17.6 line km of Induced Polarization (IP) having been completed over the target area. The principal target concept is centered on resistive and chargeable IP anomalies associated with a N-NW striking structural corridor comprising a 3 km extension of semi continuous low sulphidation Au and Ag veinlets and breccias. Figure 3 illustrates a composite of the horizontal IP chargeability maps overlaying gridded and contoured Au in soils as well as the rock chip locations and grades. The target area is divided into three target zones which, from South to North, we term, Cruz del Sur, Orion and Estrella del Norte. Cruz del Sur Target Area The Cruz del sur target is comprised of two main elements. Firstly, a zone of structurally controlled by hydrothermal breccias and silicification along the “Via Lactea fault” and secondly, the top of a strong chargeable IP anomaly which we believe represents a mineralized manto. Trench 1, in the vicinity of the Via Lactea Fault, reported 35 m of 101 ppb Au and 7.58 ppm Ag in channel samples. The strongest rock chip in the area, Sample 3337, is adjacent to the trench and reported 8.5 ppm Au and 6 ppm Ag. 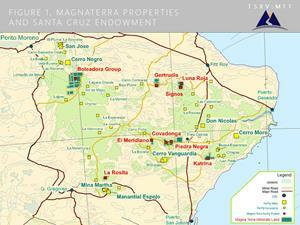 We have three holes planned for the Cruz del Sur Zone. DDH_001 and DDH_002 target mineralization beneath surface outcrops of the precious metal-bearing silica veins and breccias. The proposed collars are on the hanging wall side, western side, of the Via Lactea fault. These holes collar in felsic tuffs and then are expected to cut silicified hydrothermal breccias and strong Au and Ag mineralization associated with the Via Lactea Fault. The footwall of the fault is characterized by chargeability up to 20 mV/V which we also expect to test with this hole. DDH_003 targets the chargeable IP anomaly 250 east of DDH_002. Orion Target Area The Orion target is conceptually similar to Cruz del Sur but with some significant differences. The Via Lactea fault is over 150 m to the west of the chargeable and resistive anomalies and subsequently the surface mineralization here is less than at Cruz del Sur. The chargeable and resistive anomalies are however stronger and shallower here with the strongest anomalies being 5,000 ohms resistivity and 27 mV/V chargeability. All three targets in the Orion Zone directly target the IP anomalies, which achieve a thickness of over 100 m in this zone. Estrella del Norte Target Area The Estrella del Norte target is the site of gold-bearing quartz veins and stockworks. Whilst there seems to be an overall N-NW structural control to mineralization, the orientation of individual mineralized structures varies considerably. The longest axis of mineralization is N-NW and constitutes over 550 m of strike length. The mineralization is generally hosted in irregularly distributed stockworks of chalcedonic quartz veinlets and hydrothermal breccias. Channel samples in stock works run up to 5 ppm over 2 meters. 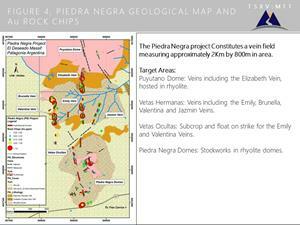 The Piedra Negra Project is located approximately 30 km N-NE of the Cerro Vanguardia Gold Mine (Anglo-Ashanti) in the southern-central portion of the Deseado Massif (see figure 1). The Project is characterized by gold bearing, low sulphidation veins and stockworks, hosted in andesitic tuffs and rhyolitic domes of the Bajo Pobre and Chon Aike Formations respectively. The Company has planned nine diamond drill holes constituting approximately 1,000 meters in this first phase of drilling. Work to date includes geological mapping and 460 select rock chip samples across an area measuring 2.5 km from north to south and between 800 m from east to west (see figure 4). Gold grade ranges up to 16.02 ppm with an average grade of 0.47 ppm including 189 samples over 0.1 ppm. 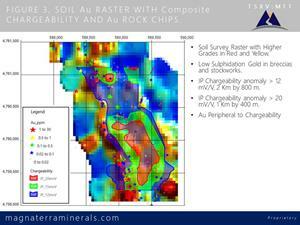 (Note that samples on this project are selected samples, with spacing being determined by availability of outcrop and sub-crop and are not necessarily representative of the mineralization hosted on the property. The Company has also completed geophysical survey constituting 60 line km of ground magnetics and 15 line km of IP. N-S striking veins seen in outcrop and verified by IP resistivity. E-W striking dilatational structures defined from IP resistivity and magnetic lows. Stockworks and associated fluid traps in rhyolitic domes seen in outcrop and verified with IP resistivity. The target area is divided, for the purposes of this campaign, into three target zones. From North to South, these are The Puyutano Dome, Vetas Hermanas and Piedra Negra Domes. (see figures 4 and 5). Puyutano Dome Target Area The most northerly zone on the project is characterized by low sulphidation veins in a rhyolitic dome complex. The main target here is the Elizabeth Vein in the southern flank of the dome. DDH_001 and 2 target the vein which averages 1.48 ppm Au from 78 rock chips and float samples over a 220 m strike length. Vetas Hermanas Target Area Vetas Hermanas zone is comprised of 1,000 meters of low sulphidation, banded, crustiform and cockade texture veins which are hosted in andesitic tuffs and ash tuffs. DDH_003 through DDH_005 target the discovery vein or Emily Vein which averages 0.75 ppm Au from 39 rock chips over a 300 m strike length. DDH_006 targets the Valentina Vein which averages 0.72 ppm Au from 21 rock chips over a 130 m strike length. Piedra Negra Domes Target Area The Piedra Negra Domes Zone is characterized by weakly positive topography representing the tops of rhyolitic domes which, in some cases, show evidence of stockworking with traces of Au. In the recessive areas between the domes there is evidence of veins in float and sub-crop. Holes DDH_007 through 9 target veins and stockworks as well as what we interpret to be fluid traps on the underside of the domes. Some statements in this release may contain forward-looking information. All statements, other than of historical fact, that address activities, events or developments that the Company believes, expects or anticipates will or may occur in the future (including, without limitation, statements regarding potential mineralization) are forward-looking statements. Forward-looking statements are generally identifiable by use of the words “may”, “will”, “should”, “continue”, “expect”, “anticipate”, “estimate”, “believe”, “intend”, “plan” or “project” or the negative of these words or other variations on these words or comparable terminology. Forward-looking statements are subject to a number of risks and uncertainties, many of which are beyond the Company’s ability to control or predict, that may cause the actual results of the Company to differ materially from those discussed in the forward-looking statements. Factors that could cause actual results or events to differ materially from current expectations include, among other things, without limitation, failure by the parties to complete the Transaction, failure to establish estimated mineral resources, the possibility that future exploration results will not be consistent with the Company’s expectations, changes in world gold markets or markets for other commodities, and other risks disclosed in the Company’s public disclosure record on file with the relevant securities regulatory authorities. Any forward-looking statement speaks only as of the date on which it is made and except as may be required by applicable securities laws, the Company disclaims any intent or obligation to update any forward-looking statement.